Fleet Week events run through the weekend. 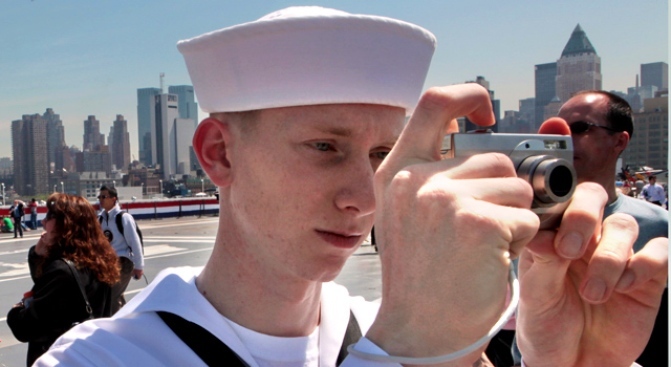 DAS BOOT: There are far too many fun Fleet Week-themed events going on this weekend for us to list here, but if we had to pick one, we'd head over to Pier 88 at 48th St. (on the West side) for the (free!) tours of Navy and Coast Guard ships. It's all very Hunt For Red October. Saturday, 8AM-5PM. WHAT A FEELING: Are you a maniac -- maniac -- on the floor? Then dance like you've never danced before (skates optional) in celebration of the Skate Into Summer party, which marks the grand re-opening of Dreamland Roller Rink in Coney Island. And yes, the theme of the night is Flashdance -- and yes, there will be prizes for costumes, so get on it, mmkay? Saturday, 7PM. PENNY ARCADE: Who says you can't make art in a recession? The 14th Annual Lower East Side Festival of the Arts kicks off on Friday and runs through Sunday, bringing a hee-uge lineup of works to the masses for exactly $0. Live music, performance, short plays, poetry, burlesque, you name it. Check theaterforthenewcity.net for more information about the events and a schedule. All weekend. MCQUEEN FOR A DAY: Q: What do you get when you throw Steve McQueen, Charles Bronson, James Coburn, Richard Attenborough, Donald Pleasence and James Garner in front of the same camera? A: John Sturges' The Great Escape (1963), an uber-classic about WWII prisoners who plot the most daring jailbreak ever conceived. It screens at the Film Society of Lincoln Center as part of the Yesterday's Loner McQueen retrospective. Sunday, 6:20PM. UNFLAPPABLE: Michael Arenella brings his big Dreamland Orchestra to the Gowanus for a roaring, rollicking '20s speakeasy extravaganza, with vintage cocktails at the (open) bar and a trove of period duds that can be yours via silent auction. The whole thing goes to raise money for the annual Jazz Age Lawn Party on Governor's Island in early June -- which is another party you really shouldn't miss. Green Building, Sunday, 9PM.